Is вЂњP0705вЂќ detected? YES >> Go to TM-161, "Diagnosis Procedure". Select вЂњD POSITION SWвЂќ, вЂњN POSITION SWвЂќ, вЂњR POSITION SWвЂќ, вЂњP POSITION SWвЂќ and вЂњL POSITION SWвЂќ. Shift selector lever through entire positions from вЂњPвЂќ to вЂњLвЂќ and check ON/OFF of each monitor item. Shift selector lever from вЂњPвЂќ to вЂњLвЂќ and check voltage between TCM harness connector terminals and ground. NO-1 [вЂњD POSITION SWвЂќ is вЂњONвЂќ when selector is not in вЂњDвЂќ position. (Or connector terminal 4 is at power voltage. )]>>GO TO 2. NO-2 [вЂњN POSITION SWвЂќ is вЂњONвЂќ when selector is not in вЂњNвЂќ position. (Or connector terminal 5 is at power voltage. )]>>GO TO 4. NO-3 [вЂњR POSITION SWвЂќ is вЂњONвЂќ when selector is not in вЂњRвЂќ position. (Or connector terminal 6 is at power voltage. )]>>GO TO 6. 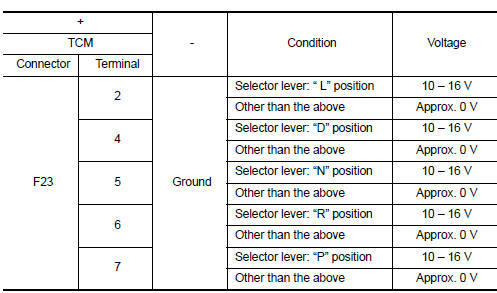 NO-4 [вЂњP POSITION SWвЂќ is вЂњONвЂќ when selector is not in вЂњPвЂќ position. (Or connector terminal 7 is at power voltage. )]>>GO TO 8. 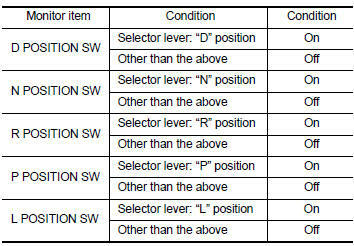 NO-5 [вЂњL POSITION SWвЂќ is вЂњONвЂќ when selector is not in вЂњLвЂќ position. (Or connector terminal 2 is at power voltage. )]>>GO TO 10. Check continuity between TCM harness connector terminals. Is the check result normal? YES >> GO TO 12. Is the check result normal? YES >> GO TO 9. Is the check result normal? YES >> GO TO 11. 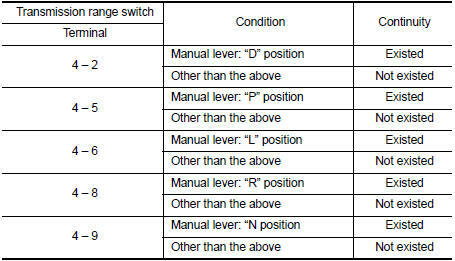 Check transmission range switch. Refer to TM-165, "Component Inspection".